Joss Stone talks about her dual-role as Bond Girl and title song artist in the new James Bond videogame "Blood Stone"
Joss Stone was revealed as the latest Bond Girl yesterday at the London press launch of the latest videogame "Blood Stone", starring opposite Daniel Craig as 007. Activision held the "Bond Event 2010" at the One Marylebone conference venue in central London, parking an Aston Martin outside the doors to let invited guests know they were at the right place. Speaking at the launch event, Stone said: ''I'm the first Bond girl from the West Country - instead of Martini in my glass I'm drinking cider and nobody will ever know. I'm also the first Bond girl with a nose ring!" Stone will play a dual role in the new James Bond game - playing socialite Nicole Hunter and performing the title song "I'll Take It All". The song was co-written by Eurythmics star Dave Stewart, and has a 'Shirley Bassey vibe' about it. ''Oh my God, Shirley Bassey rocks and nobody will ever get to there,'' Stone said. ''She's really powerful but there's no ad-libbing or warbling because it wasn't needed. I was just inspired by her and I tried to sing it in a really straight, powerful way. But I haven't really got a big voice like Christina Aguilera or somebody, it's trickery, I'm just loud and I can fake it a little bit." 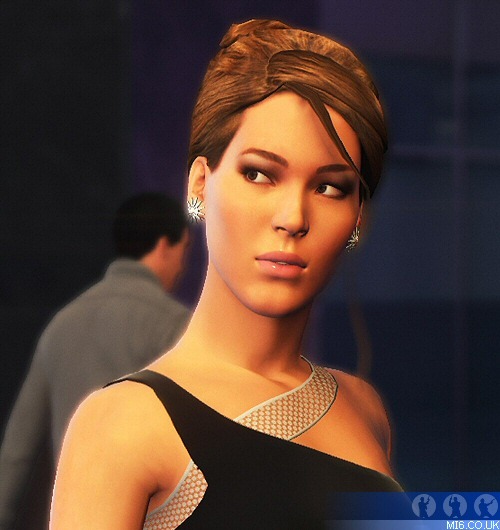 Above: Joss Stone wore the same dress and earrings to the launch as her character wears in the game. Stone said she played her Bond girl a ''bit like a posh version of Paris Hilton''. new 'Bond girl' for the upcoming action video game, 'Blood Stone'. Despite lending her voice and likeness to the lead female role in the game, Stone never got to meet Daniel Craig, who is voicing 007. Stone expressed her disappointment as she finds him ''incredibly hot''. Contrary to a lot of media coverage, Stone is not the first actress/singer to play a "Bond Girl" original character in a 007 videogame. Shannon Elizabeth, Heidi Klum, Misaki Ito and Mya Harrison started the trend in EA's "Everything or Nothing" (2004), followed by Maria Menounos in the 2005 game "From Russia With Love".